I was asked by two Patrons, Cathy W. and the Steger family to make more fairy tale and mermaid paper dolls. So, I decided to finally get around to a posting a paper doll I drew last year. When I create mermaid paper dolls, I always think of Liana’s mermaids. Who was Liana? You wonder, well, she ran a site called Liana’s Paper Dolls and created the best mermaid paper dolls. The mermaids of Liana of Liana’s Paper Dolls. Her mermaids weren’t just beautiful and innovative, this black tailed adventurer mermaid was a favorite of mine, but also had amazing detail stories about the world that mermaids came from. If you’re new to the paper doll website world and you’ve never spent anytime on her site, you really should. She’s not updating these days, but there’s plenty of backlog and her art is really outstanding. I would suspect that there would be no other paper doll blogs (and certainly this site wouldn’t exist) if not for Liana’s Paper Doll blog. Any of my paper doll blogging friends feel the same way? Frankly I’m not good with coming up with personal stories about my paper dolls. I rarely think of them that way. I sometimes think about time period or technology level, but I tend to think on a society level rather than on a personality level. For example, I love writing pseudo Victorian descriptions for my steampunk outfits (like this one), but I can’t imagine trying to decide the personality of the doll. Bios like these Boots writes are just impossible for me to imagine. I think this is okay though. The world would be super boring if we were all alike. Or if you’d rather become a Patron and see behind the scenes, then donate through Patreon. While I liked all the mermaid paper doll tails this week, I’ll confess openly that this is my favorite set of the bunch. It seems fitting to end the week on my favorite, doesn’t it? Zachary’s tail was based on the eel and then Ursula’s tail as made to match. Of course, any of the Sprites can wear these tails. I ran out of shirts for Zachary, so he doesn’t get one this round, but Ursula gets two to make up for it. And he does get a stylish knife and trident, though I suppose either of them could be wielding those weapons. I thought of him when I made them. 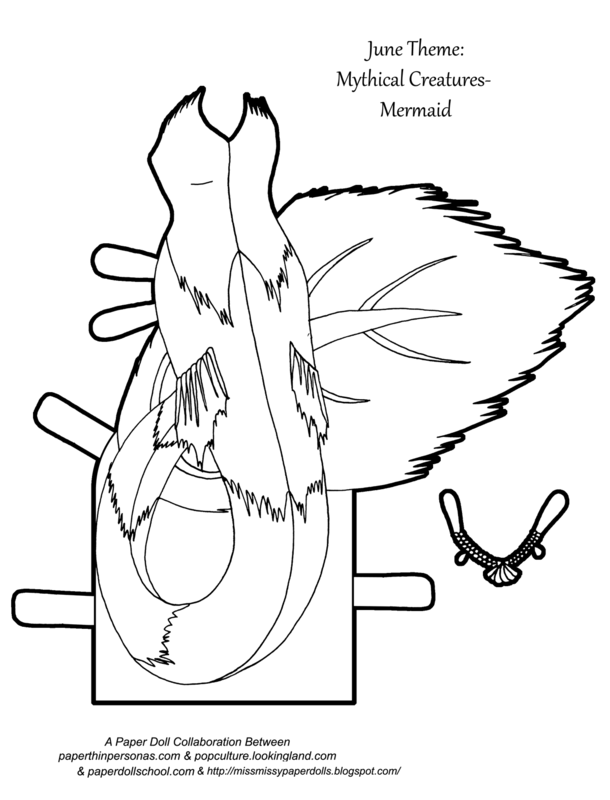 As I said with several of the other mermaid tails, I would recommend strongly adding floating tabs to the back of the tails as needed to secure them to the paper doll’s body. Also, if you missed Zachary and Ursula, I posted them on Monday. Any of the Sprites Dolls can wear these tails or any of the other tails! You can see the whole week’s work below. 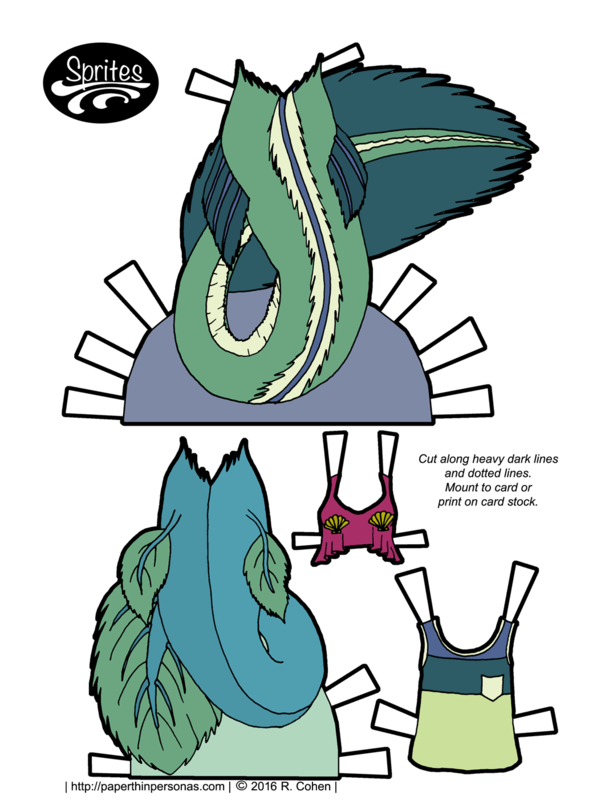 Mix and Match Black Mermaid Paper Dolls! I posted a blog on my Patreon page about finding inspiration a couple of days ago. You can read it over there for the next few days, but I’m closing it to non-Patrons on Monday. So hop over there and consider joining if you’s like to support the blog. Want updates on the blog? Follow PTP on Twitter. May I make a confession? I always liked my mermaids more dark and creepy than sweet an innocent. A lot more drowning sailors and a lot less singing songs with hermit crabs. 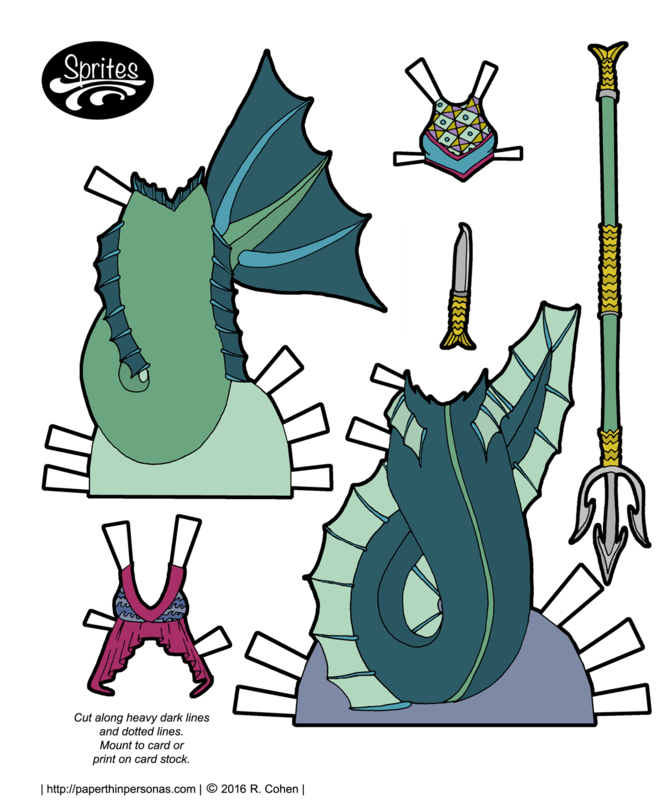 If you missed the paper dolls to wear theses colorful mermaid tails then slip over to Monday’s post for them, but any of the Spite paper dolls can fit the tails. I should also mention that the tails may need floating tabs to be really secure. I confess I didn’t play-test them. If you want paper doll updates on Twitter, I’ve split my person and “blog” twitter accounts, so follow here:@paperpersonas. And if you like the blog, than consider becoming a Patron. All right my readers, how do you like your mermaids? Sweet and musical or dark and creepy? Ursula & Zachary Under the Sea: Mermaids Tails! As promised, today we have mermaid tails and the shirt that inspired this entire set. There are shirts like this all over the interwebs, but I liked the idea of a modern mermaid with a tongue in cheek style who wears a printed shirt with seashells, rather than the “real” thing. So, all my mermaid tops this week will be based on bikinis rather then the assumption that mermaids simply wear seashells. Because, honestly, am I the only one who imagines wearing hard seashells as a bra would be really really uncomfortable? I bet any smart mermaid would take a well made swimsuit top in an instant. 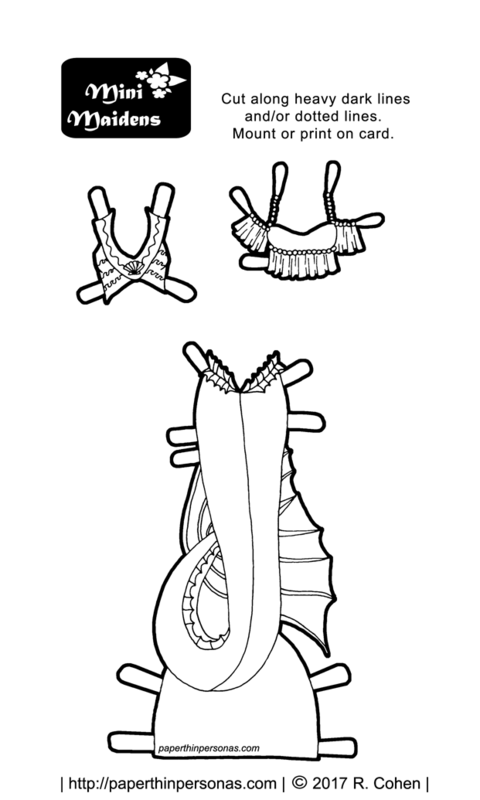 Designing male paper doll mermaid tops is a little harder. I think they would mostly get in the way, but in the interest of being fair to Zachary and Ursula, I have included one. If you missed the paper dolls to wear theses smashing tails then hop over to Monday’s post for them. If you want paper doll updates on Twitter, I’ve split my person and “blog” twitter accounts, so follow here:@paperpersonas. So, yeah, there are no tails. This wasn’t my original plan. My original plan was to have Zachary with a tail on Monday and Ursula with a tail on Tuesday. Then to post joint outfits for them on the following days. I thought this was a great plan, until I realized I could not fit the tail and the Zachary paper doll on the same page together. It simply did not fit. And to think my layout problems were a thing of the past? Sigh. So, instead we get two paper dolls and a promise of tails tomorrow. I swear these are mermaids. They’re just tailless mermaids. Reminder that the black and white versions are linked up at the top of the post, if anyone is looking for it. Anyway, Zachary and Ursula are both from the Sprites series which I introduced WAY back in January. As some of you may recall, I have been naming the Sprite faces in reverse alphabetical and I had gotten to the letter U, so Ursula it was. I realized later that making the first Ursula paper doll a mermaid does bring up connotations of Disney’s A Little Mermaid, but that wasn’t my intention. I named the paper doll LONG before I picked out a theme and I could have started with a modern set, but mermaids were more fun. Her hair was inspired by this pin of a woman with teal hair on Pinterest. Lastly, you love the blog, consider supporting it on Patreon. If you want paper doll updates on Twitter, I’ve moved them over to @paperpersonas.